a million ebooks on Amazon. Amazon's Best Selling eBooks of 2011. J.A. Konrath earned $100,000 in ebook royalties in just 3 weeks! earning enough money to make their lives easier. Would you like your success story to be next? The eBook Revolution is still in high gear as ebook sales continue their explosive growth, especially on Amazon, which is FABULOUS news for both Indie and traditionally published authors! What's particularly EXCITING is that an ebook can be any length, which greatly expands an author's publishing options. You can publish articles, reports, short stories, or a compilation of blog posts as an ebook. Past content that you've already written and polished can be turned into an ebook, allowing you to make money, expand your visibility, and promote your other books, products, and services fairly quickly and easily. ... or other content that you have the rights to, finished or unfinished, just sitting on your computer gathering dust that you'd like to turn into lead generation and income producing ebooks? The good news is that ebooks are easier than ever to publish. You can upload an ebook in minutes, format it in hours, and in a day or two it will be live on Amazon, Barnes & Noble, Smashwords, or anywhere else you want it to be available, ready to start making sales. But don't let anyone fool you--to be a successful ebook author takes knowledge, skill and work. I've seen too many authors upload their ebooks to Amazon, and elsewhere, before addressing some of the most essential elements of ebook success, and then wonder... "Where are the legions of ebook buyers I've been hearing so much about?" Whether you want to publish non-fiction or a novel, an ebook or a print book, become an Indie author or go the traditional publishing route, the formula for success is the same. What does it take to succeed as an ebook author? I know that sounds like a lot (and it is) but there's no need to worry... you don't have to do it all at once and you don't have to do any of it perfectly. Yet if you address these ESSENTIAL elements of ebook success--doing the best you can, from wherever you are in the writing and publishing process--when you receive royalties from selling hundreds or even thousands of ebooks, instead of just a handful, you'll be glad you did. Of course, I can't guarantee how many ebooks anyone will sell as there are far too many variables to consider, but I can say with certainty that if you want to be a successful ebook author then it's important to build a strong foundation. Too many skimp on this aspect of ebook publishing in their enthusiasm to get ebooks out as quickly as possible, and end up paying for it with lost ebook sales and missed opportunities. Of course, one of the WONDERFUL things about ebooks is that you can update or redo any aspect of them, whenever you want, and then simply upload the new edition. Success leaves clues that anyone who's interested can find and follow. This Is an Exciting Time To Be an Author! There has never been a time like this. Independent authors are having INCREDIBLE success. Amanda Hocking, John Locke, Darcie Chan, J.A. Konrath, and so many others have shown us what's possible with great writing, powerful promotion, and a savvy ebook strategy. But you don't have to be an ebook superstar to benefit from the ebook gold rush that's happening, now. So get your first ebook up, if you haven't already, and start growing your number of published titles. Begin with what's easiest, with a small ebook of previously written pieces. However, depending on the way you present the material and how seamlessly you want the stories or articles to flow together, when you're combining a number of pieces that weren't originally written as a series (or even if they were) you may need to edit, update, or re-envision one or more of the pieces in order to make them fit together better, or write a new article or two in order to make sure all the important points you want covered are included. I'm currently updating an ebook I wrote several years ago on one-page book proposals, which is a bit of a misnomer as they're typically 3 to 5 pages long. Since this was already a complete ebook, I thought there would be very little work to do. I may have underestimated that a bit. I updated my ebook cover to include photos of three ebooks I'm working on that will be coming out in the next few months. I updated one of the sidebars that had book sales information. I read through and edited the entire ebook. This was written before the ebook revolution, so I'm adding a page on self-publishing and ebooks. As this was written primarily for non-fiction authors, but can be used by novelists, as well, I'm adding a piece that highlights how fiction proposals differ from non-fiction proposals. I'm also adding a One-Page Novel Proposal template to go along with the One-Page Non-Fiction Proposal template that's already there. To make the ebook even more practical and helpful, I'm adding a previously written article on brainstorming your non-fiction book using competitive titles, and creating a new piece on brainstorming your marketing and promotion plan that both fiction and non-fiction authors can use. I'm also adding some in-book promotion for How to Write Fast, Right Now! a one-hour talk I gave, as well as a page about the work I do as a writing and ebook coach. Lastly, I'm editing my hour-long audio interview with literary agent Michael Larsen, and will include it with the ebook as a bonus. So much for quick and easy! You may be wondering... why do all that extra work? As they say in internet marketing circles, "Good enough is good enough. Just get it out." It's true, this could have been up in a few days, instead of a few weeks. So why am I doing all this work on an ebook that was already done? Because, as attractive as "quick and easy" is, I prefer "successful." By addressing fiction book proposals, I've doubled my audience (also known as: potential book buyers). By adding the brainstorming pieces, my ebook will be more useful and UNIQUE. This will help me turn readers into fans who'll want to buy more books from me or hire me as a coach. By adding the promotional pages at the end of my ebook, I'll introduce my readers to other books, products and services of mine that might interest them and turn into additional sales. Having success with one ebook is fabulous, but real success comes when readers like your ebook so much that they buy all the other ebooks you have available, as well as the next ebook you write, and the next. That's why it's important to have a number of ebooks available, and to make each one is as good as it can be within a reasonable amount of time. The challenge is always to find the right balance between quality and quickness that works for you. 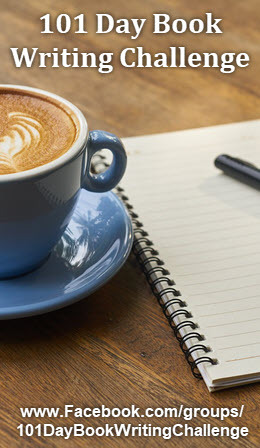 Don't forget, after you finish the ebook there's still more to be done—create a compelling book description, write some promotional blog posts, do some social media marketing on Twitter and Facebook--all while writing your next ebook. If you want to make a living as an author, you have to treat your readers with respect and your writing as a career. That means caring about your ebook's quality, value and appeal. It means knowing who your audience is and what they want and need. It means being willing to promote your books and yourself, even if you'd rather be writing. But please, PLEASE don't let the avalanche of details scare you away.They're the MAGIC that makes everything work! I love each and every one of these details in the same way I love every round of editing. I know that when I'm editing a piece, every pass through the material makes my writing better and my words SING. Editing helps me communicate the ideas I'm passionate about more clearly and powerfully. In the same way, as I'm going through this process of editing, updating, and adding new material to my ebook, instead of getting frustrated by how long it's taking, I'm focused on the fact that every day my ebook is getting better and moving swiftly from "okay" to AWESOME! I know that all the work I'm doing is going to translate into greater success once the book is launched, which allows me to continue making a living doing what I LOVE. There's nothing in the world better than that! Yes, becoming a successful author takes work, but it is SO worth it! I know this is a lot to take in, but as I said--you only have to do one thing at a time, and you don't have to do any of it perfectly (although you want your ebook to be as polished as possible). 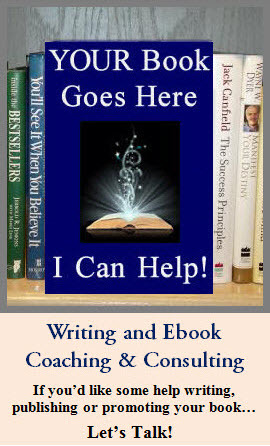 If you'd like some help navigating the details of writing and promoting your ebook, please visit my ebook coaching page. I love helping authors build a strong foundation for their ebook success. 2012 has just begun and is overflowing with possibilities! The eBook Revolution is continuing to explode, which is great news for both Indie and traditionally published authors! It's a particularly exciting development for self-publishers because ebooks can be any length, and even if your ultimate goal is a print book, you can test market an ebook at very low cost and work out all the kinks before spending money on a print run.